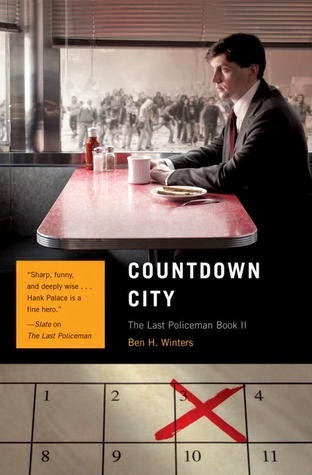 Count­down City by Ben H. Win­ters is the sec­ond novel in a tril­ogy. The first book, The Last Police­man, intro­duces the reader to a doomed world and a cast of characters. Hank Palace used to be a police offi­cer with the Con­cord, NH police depart­ment, how­ever the world is com­ing to an end and the PD has been fed­er­al­ized. Hank still has a sense of pur­pose, and when an old friend asks him to find her miss­ing hus­band he takes on the challenge. How can he find some­one in a world with no gaso­line, no phones, no way to tell if the hus­band is sim­ply ful­fill­ing his wishes before he dies. Count­down City by Ben H. Win­ters finds the world 77 days before a huge meteor will hit and will end life as we know it. As expected many peo­ple are going nuts, the gov­ern­ment declares (basi­cally) mar­tial law and no one is really pay­ing atten­tion unless you have a gun. Our hero, ex-policeman Hank Palace, does have a gun and a sense of duty and pur­pose but he starts los­ing hope as it becomes more clear that the inevitable is about to hap­pen. The char­ac­ters around Hank start speak­ing as if they out­side the novel, but can talk to the pro­tag­o­nist, basi­cally telling him to stop being so naïve and start fac­ing reality. The mys­tery is far­fetched and the author asks the reader to take a leap of faith when it comes to the plot. Palace eye sight must be super­hu­man for him to observe all the minis­cule clues and leaps in logic – but that’s not what the story is really about so he gets a pass. This is another well writ­ten, inter­est­ing book where the sto­ry­line takes sec­ond place to the descrip­tions of a soon to be doomed world and how soci­ety falls apart at the seams. Mr. Win­ters nar­ra­tive is well writ­ten, eas­ily read and cre­ates a thrilling world.